Now that a couple of weeks have gone by since school started, hopefully we are beginning to settle into our new living situations. Whether you are living on or off campus, I think we could all benefit from having some cheap, versatile, and delicious foods on hand. As a foodie, I could make an exhaustive list of staple foods, but I did everything in my willpower to limit it to six must-have items. Even if we plan to wake up an hour before class to have a nutritious breakfast, we all know there are days when we need a quick fix. Energy, protein, and granola bars are some of the easiest snacks to take on the go. Even so, they can be filled with many additives, including an excess of added sugars. With this in mind, try reaching for bars sweetened with natural ingredients like dates, honey, or coconut sugar. This is one of the best sources of vegetarian protein! 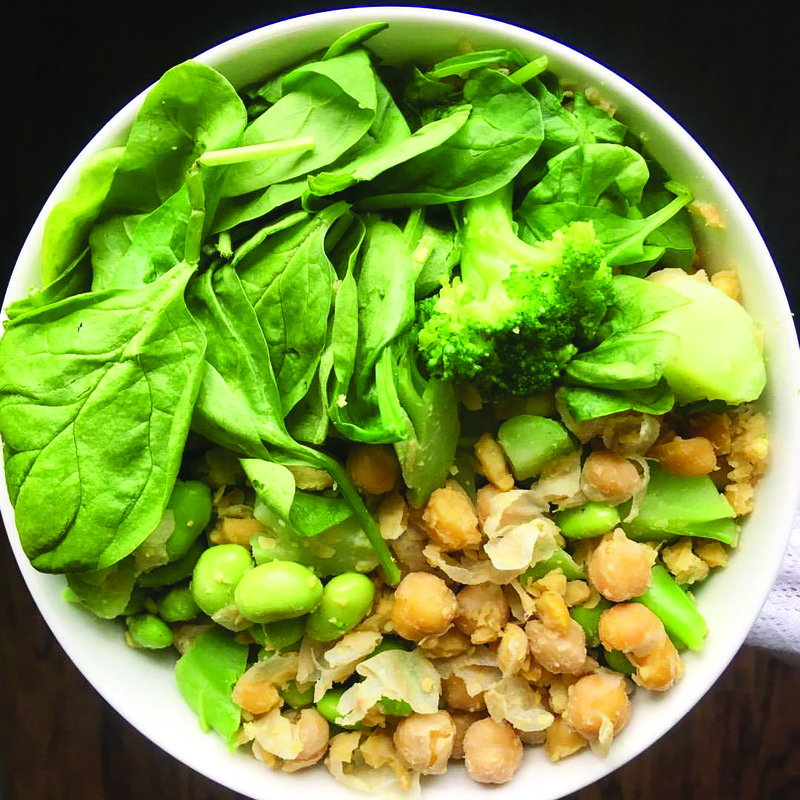 My favorites are chickpeas and lentils, as they add texture to my grain bowls and bulk up my salads. Canned beans have a long shelf life, but that often means the product comes packaged with many chemicals. Try purchasing some with an ingredient list of only beans, water, and salt. Fresh vegetables can easily go bad, so a better investment would be in frozen vegetables. Peas, broccoli, brussels sprouts, edamame, and riced cauliflower are necessities of mine, but find what works for you. It is always good to have a bit of variety. Oatmeal has tons of fiber to keep you fuller loger, and it is customizable because you can choose what type to use (steel cut, rolled, instant), how to prepare them (on the stove top or in the microwave), and how to enjoy them. It does not have to be bland. If you are craving a sweet version, add fruits, nut butter, and some granola (or check out last week’s recipe). If you prefer savory flavors, mix in some nutritional yeast and veggies, and top it with an egg. Besides tasting delicious, nuts contain heart-healthy fats needed to keep our bodies and brains functioning optimally. Enjoy them as a topping, in a sauce, in baked goods, or even straight out of the jar! Make sure to read the ingredient(s) label on nut butter jars, because many of them have added sugars. For those of you who are allergic to nuts, sunflower seed butter would work too. Scrambled. Poached. Hard Boiled. Yes, it can be done in the microwave! If I had access to a kitchen, I would make eggs in a skillet, but the microwave still does a pretty good job. Just like oats, eggs can be made however you fancy. Even if you do not like this inexpensive source of protein on its own, eggs can be incorporated in many other ways. For example, you can always make a microwavable mug cake!